Iran talks: The only thing keeping them going is the desperation of the Obama and Rouhani administrations. 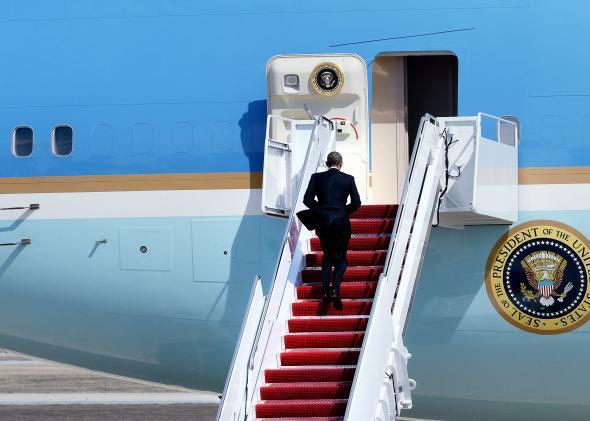 President Obama boards Air Force One after making a statement on Iran nuclear negotiations in the White House April 2, 2015, in Washington, D.C.
With the ongoing talks over Iran’s nuclear program on track to continue past tomorrow’s deadline and Iranian Foreign Minister Javad Zarif heading back to Tehran for consultations with his government, major differences between the two sides remain over issues including the pace of sanctions relief, inspections of Iran’s nuclear facilities, and whether Tehran will account for its past alleged military activities. Amid this bleak landscape, the main reason to still expect a deal to come together is the amount of political capital the Iranian and American presidential administrations have sunk into making it work—and just how bad it would look for both if it didn’t. That’s not nothing. The other five powers negotiating with Iran haven’t demonstrated the same sense of urgency. France, which has surprised many by taking the toughest line in the P5+1, has consistently said that there’s no reason to rush a deal rather than wait for Iran to accept more favorable terms. On the other side, Iran’s trading partner Russia, which doesn’t have an awful lot to gain from improved U.S.-Iranian ties, hasn’t demonstrated much willingness to make major political compromises to further a deal’s chances. The Americans can’t afford to be so blasé. Some of the time pressures on the administration are legally binding: Thanks to an agreement reached with a skeptical Congress, if the White House can’t present a deal to Congress by July 9, the mandated congressional review period doubles from 30 days to 60 days. If there’s no deal by September, Congress can seek to put new sanctions in place. Politically, the president has also made clear that he views the deal as the centerpiece of his foreign policy. If nothing else, the deal, which aides have compared to the Affordable Care Act in its political importance, would be a rare diplomatic victory amid the shambles of U.S. policy in the Middle East. It won’t be clear for some time if an agreement is successful at preventing Iran from building a nuclear program, and Republicans will likely criticize sanctions relief as too generous no matter what happens, but Democrats would no doubt like to have some deal in place before a presidential campaign involving the president’s former secretary of state ramps up. The pressure is even greater for President Hassan Rouhani, for whom achieving détente with the West and securing sanctions relief are not only his primary foreign policy goal, but his primary plan for rescuing Iran’s faltering economy. A majority of Iranians support the deal, and his election was widely seen as a mandate to attempt to improve relations with the West. If he fails, he’ll face an immediate backlash not only from opponents but from supporters as well. After Rouhani recently suggested that cleaning up Iran’s environment would be easier once sanctions were lifted, opponents mocked him for tying the “water, wind, soil and forests” to his signature diplomatic initiative. He has also frustrated some supporters by avoiding confrontation with hard-liners in Tehran, including over human rights issues, in a bid to win support for the nuclear deal. This has had mixed success. The president has been heckled by opponents of the agreement in public appearances, and the legislature has sought to add conditions to the deal, reducing his room to negotiate. Most importantly, Iran’s supreme leader has publicly ruled out some of the compromises that will likely be required to make a deal work, though some observers say these statements shouldn’t be taken at face value. Rouhani’s allies are hopeful of a major political breakthrough in next year’s legislative elections, but they likely need a nuclear deal and the accompanying sanctions relief to avoid a return to the political wilderness. On the surface, all signs point toward the talks collapsing right now, but given what’s at stake for these two presidents, it’s hard to imagine them leaving the table until all hope has been lost—maybe even longer.